Efficiency, versatility and expandability: VINN Phone brings the communication in the hotel to a new level. With VINN Phone, we provide you with a cost-effective software-based IP telephone system. Depending on the requirements, we install these on-site on a computer or at our computer centre in Germany. With VINN Phone, we provide you with a cost-effective software-based IP telephone system. Depending on the requirements, we install these on-site on a computer or at our computer centre in Germany. With VoIP SIP trunks, the operating costs are reduced to a minimum. SIP trunks allow direct dial-up to many terminals with their own extension numbers and with only one account. In combination with a VoIP gateway and SIP standard telephones, you will have a complete telephone system. VINN Phone is compatible with most existing infrastructures. Via a SIP gateway, existing telephones can also be connected. As a further module, you can integrate to the Hotel’s Property Management System (PMS). 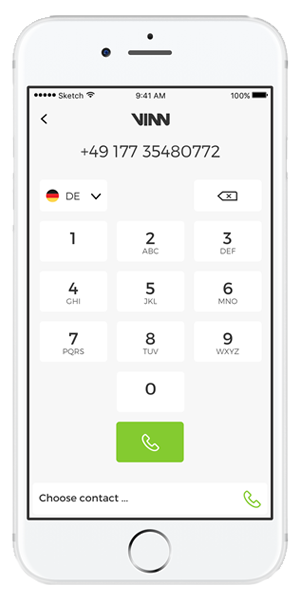 Through the switchboard, you will then have full control over incoming and outgoing calls. If your hotel is not considering offering an in-room telephone in the future however, we can also provide an innovative solution here. A softphone client, which is integrated in VINN Cockpit, turns the mobile device of the guest into a complete room telephone. This means that the guest can be reached via their room number from within the hotel, and from outside.